Call it digital age’s side effects or sheer irony, but as much as digital learners would like to engage well with a course, they don’t want to sit through it. Even worse, they dread witnessing dry PowerPoint slides. They are constantly distracted by so many other things around. That snapchat message definitely needs the first attention. And their constantly decreasing attention span just adds to your woes as a course creator. So, to make this entire process of eLearning interesting and engaging for them, you decide to bring in interactivity. You get an interactivity building tool, acquire access to its huge library of templates, and include these interactions in your course. And whoa! It does seem to work. With their ability to let the learner interact with them at various touch points, interactive eLearning templates are meant to make eLearning engaging by their design itself. They are also meant to ease course creation since you could just use them rapidly without any programming. But like any good thing, they too can fail at their job if not used effectively. Here are some best practices to follow when working with interactive eLearning templates to ensure their optimal usage and get the best results. I cannot emphasize enough on the importance of using just the right amount of interactivity in your course. Having access to a huge library of interactive templates does give you the power to use them infinitely but remember; there is a fine line between engaging learners interactively and frustrating them by having them pass through endless challenges. It is true that lesser or no interactivity might make the course boring, but more interactivity doesn’t necessarily convert into more engagement. Strike the right balance and don’t overdo it. Analyze well right at the planning stage and be thoughtful about the addition of each interactive element to your course. It should serve a distinct purpose and if it doesn’t, do away with it. Who would enjoy a course that only comprises flash-card reveals one after the other or just keeps playing a video? These could be powerful interactions in their own regard, but you need to give your learners a good variety to enjoy. This would avoid any monotony setting in and would keep learners engaged. If you have used flash cards at the onset, it might be a good idea to close the course with a reinforcement video. Or if you have used a character dialog to explain the basics, consider using flash cards for a quick reinforcement further on in the course. The beauty of having access to a library of interactive learning templates is that you have a huge variety at your disposal. Use this power to the fullest, and cook up your course with a host of formats like interactive presentations, scenarios, quizzes, games, videos, and more. Different kinds of eLearning interactions serve different purposes. When incorporating them into your course, first analyze what type of knowledge you are looking to impart; is it factual or procedural? If all you need them to do is to remember some terms or symbols by the end of the course, then a straightforward memorize and recall interaction can solve the purpose. But if it is a procedure or process you need them to learn, then a scenario-based approach might be the best to follow. Another important consideration is to analyze whether learning needs to be active or passive. Do you need your learners to learn some facts and figures as part of a compliance routine, or do you want them to practice a real-life skill? For the former, you won’t need any complex interactions. Most level 1 interactions would be good enough. But if it is a skill that requires learners to practice and learn, then you require advanced interactions that let them do so. So, ultimately, the kind or level of interactions that you use should be based on your module’s learning objectives. A good interactivity builder allows basic reuse provisions like pre-branding the templates, setting global properties like colors, fonts, etc., to avoid any duplication efforts. So, if you have such a tool, make the best use of it. Prep and save your templates beforehand so that you don’t spend your efforts branding them every single time. Make them easily re-usable. This way, you would just need to change the content at the onset of a new module, and you would be good to go. Prep sheets are a smarter and easier way to work when you have a plethora of interaction templates to choose from. You can maintain prep sheets for all or the frequently used templates. These sheets basically simplify the content organization process and outline multiple parameters available in specific interaction templates, along with content placeholders. They are specifically useful if you work in a team since they enable team members to visualize the interaction outline and share course content accordingly. Here is an example of how prep sheets look like for one of the popular interactivity building tools in the market. It is easy to be carried away when you have a large set of templates to choose from, but it is wise to analyze the need and use of each interaction that you plan to use in a course. See whether it fills into most of the above buckets, and then proceed to use it. I hope these best practices come in handy when you get down to using your interactive learning templates’ library. 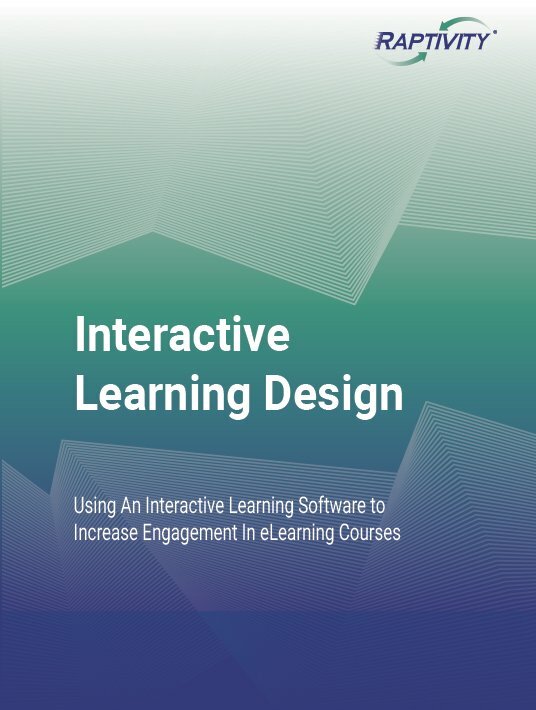 For more practical aspects of interactive learning design download the free eBook Interactive Learning Design: Using An Interactive Learning Software To Increase Engagement In eLearning Courses.